Fantagraphics Books, 2009. 323 pages. It's that time of year again. 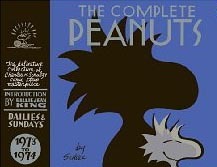 Every six months, Fantagraphics Books comes out with another two-year volume of their collection of the complete Peanuts comic strip, and every six months, I need to remind my readers how marvellous each new volume is. In the 1973-1974 collection, we have many wonderful classics of the strip. Charlie Brown almost meets his hero Joe Shlabotnik. Incredibly, Charlie Brown's team wins a baseball game -- but then has to forfeit because of gambling. Then he has his whole episode where he develops a rash like a baseball seam on the back of his head. Lucy continues to bewail the fate of being in love with a musician, poor thing. Sally continues to write reports with creative explanations. (Did you know that people who encourage vandalism are Evandalists?) Snoopy is still quite the athlete, and still does impressions. I loved the strip where he imitates a vulture -- but stops, embarrassed, when Woodstock lands next to him and starts doing the same thing. She wanted to live in Canada. He wanted to live in Mexico. Thus, they parted. Years later, when asked the reason, she replied simply, "I just didn't like his latitude!"